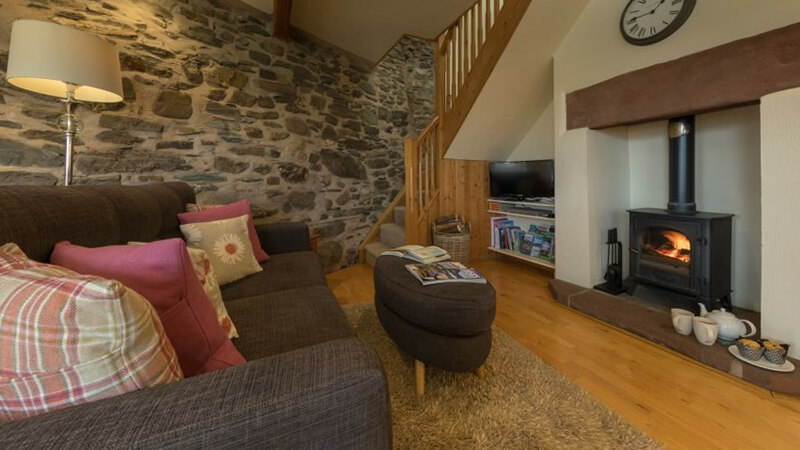 Our two self-catering cottages are located in a quiet village location set back a small distance from the minor road that runs through Thornthwaite. There is a slight incline from the road into the car parking area. The nearest town is Keswick which is 3 miles away and offers a wide range of amenities (supermarket, petrol station, bus terminal, banks, post office, doctor surgeries, optician, vet, bars, restaurants, theatre, cinema, shops, tourist information etc). 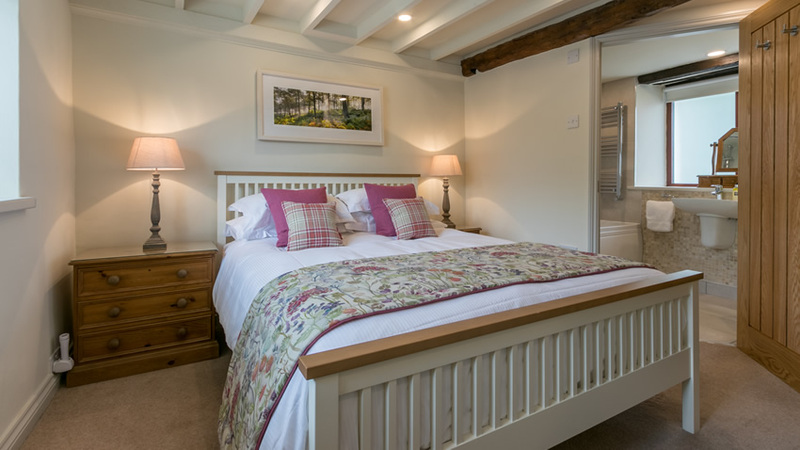 Squirrel cottage has one bedroom on the first floor and Fox Howe cottage has two bedrooms, both on the ground floor. 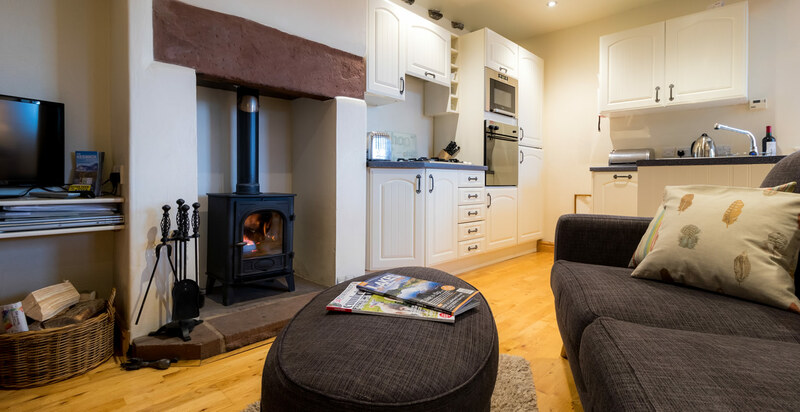 The following information will help you decide if either of these cottages are suitable for your holiday however if you have any queries or require any assistance please phone 017687 78225 or email info@croftlandscottages.co.uk. The nearest train station is Penrith - 21 miles. Accessible taxis can be booked from Allerdale Rural Transport on 01900 65968. Bus service X5 (Workington-Cockermouth-Keswick-Penrith) runs directly past the cottages. RADAR accessible toilets are available at locations throughout the Lake District. Shopping deliveries - Tesco, Sainsburys and Asda supermarkets provide a delivery service to this area. If you wish to arrange for a food delivery prior to your arrival we would be very happy to receive the delivery and put it away for you. Please call us first on 017687 78225 to arrange the best time. Large print versions of this access statement and information about the cottages can be provided via email or post on request. Keys can be collected directly from us at Croftlands House next door or we can bring them out to you in the car park on request. As we live next door we will always be there to greet you on arrival and show you round your cottage. If arriving by car there is private off road parking adjacent to the cottages (two spaces for Fox Howe cottage and one space for Squirrel cottage). This is 5m from the cottage entrances. The parking area is gravelled and slightly uneven. The turning into the car park from the road slopes up and is a tight turn in between a wall and a hedge. There are no lights in the car park area but there is an outside light at the front door of each cottage. There is a street light on the road directly adjacent to the car park area. There are 3 steps up to the front entrance door with a hand rail on both sides. No level access is provided. Once inside the cottage all the rooms are on one level with no steps. The clear door opening width of the front entrance door is 760mm (30 inch). There is a threshold of 40mm (1.5inch) when entering the cottage. The front entrance door opens directly into the open plan living area comprising a lounge, dining and kitchen area. There is one double sofa and 2 easy chairs (one reclining) all with arms. A low rectangular coffee table sits in front of these. All the furniture described is moveable. A subtitle service is available on the TV. Lighting is provided by two ceiling pendant lights and two floor standing lights. The dining table can easily be moved to allow space for a wheelchair. The clear height under the dining table is 610mm (24inch). The accompanying 4 chairs are upright and have padded seats with no arms. The flooring is wooden with a rug in front of the log burner. The work surface is 910mm (36inch) high. The sink and gas hob are built in to the work surface. The tap is a single mixer tap with small lever handles. Below the work surface there are cupboards, an electric oven with a drop down door, a dishwasher and a washer dryer. The microwave is free standing and sits on top of the work surface. The freezer sits on the floor below the fridge. The highest drawer in it is at 1040mm (41inch). The fridge sits above the freezer. The lowest shelf in the fridge is 1400mm (55inch) and the highest shelf is 1800mm (71inch). The wall cupboards lowest shelves are 1370mm (54inch) and the highest are 1850mm (73inch). The crockery, cups and glasses from these could be moved to units under the work surface on request. The kettle is cordless and can swivel by 360 degrees. Lighting is provided by down lights and under unit lights. The clear door opening widths from the living area into the internal corridor and at the far end of the corridor are both 710mm (28inch) wide. The clear door opening width into the bedroom is 710mm (28inch). There is limited space in the bedroom and the furniture cannot be moved around. There is a king size bed and the height from the floor to the top of the mattress is 660mm (26inch). Height of clear space under the bed is 300mm (12inch). The minimum clear space to one side of the bed is 380mm (15inch) and the maximum is 710mm (28inch). The room is lit by one pendant ceiling light and two bedside table lights. The doors are original pine colour, the walls are magnolia and the carpet is beige in colour. There is a wardrobe with a large single drawer underneath. The wardrobe rail is not moveable. There are two bedside tables with drawers in. All the bedding is made of non-allergenic materials. Free space in the shower room is minimal. The clear door opening width is 640mm (25inch). The toilet seat height is 430mm (17inch) and there is minimal space to the right of the toilet. The washbasin in partially integrated. The height of the washbasin is 880mm (34.5inch). There is limited clear space underneath. There is a single mixer tap with lever handles. There are no support rails anywhere in the en-suite. There is down lighting in the en-suite and a fluorescent strip light above the sink and a shaver point. The flooring and walls are a neutral colour. The flooring and walls tiled. The furniture cannot easily be moved. The height from the floor to the top of each mattress is 560mm (22inch). There is no clear space under the beds due to under bed drawers. Free space in the bathroom is minimal. The height of the bath side is 550mm (21.5inch). There is a shower over the bath. The height of the washbasin is 850mm (33.5inch). It sits on a pedestal and there is limited clear space underneath. There is a single mixer tap with lever handles. There is down lighting in the en-suite and a mirror with integreated lights and shaver point. The flooring and walls are tiled. Directly opposite the front entrance door there is a rear external door leading out to the patio area. This door has a clear door opening width of 750mm (29.5inch). The threshold is 40mm (1.5inch) high. The surface of the patio is gravelled and slightly uneven. The patio area is enclosed by a trellis fence and is lit by an external wall light. The entrance is from the car parking area into a small porch at ground level. The clear door opening width of the external door into the porch is 790mm (31inch) and the height difference from the outside to the top of the threshold is 130mm (5inch). The inner doorway from the porch into the open plan living area (lounge, dining and kitchen) has a clear opening width of 760mm (30inch). There is a double sofa and a low coffee table sits in front of this. The furniture described is moveable. Lighting is provided by several down lights, a floor standing light and a table light. The clear height under the dining table is 640mm (25 inch). The accompanying 2 chairs are upright and have padded seats with no arms. Below the work surface there are cupboards, a dishwasher and a washer dryer. The microwave is built in and the controls at the top of it are 1750 (69inch) high. The freezer sits on the floor below the fridge. The highest drawer in it is at 970mm (38inch). The fridge sits above the freezer. The lowest shelf in the fridge is 1350mm (53inch) and the highest shelf is 1780mm (70inch). The wall cupboards lowest shelves are 1420mm (56inch) and the hi0ghest are 178mm (70inch). The crockery, cups and glasses from these could be moved to units under the work surface on request. The cooker height is 990mm (39inch) and has a drop down door. There are 13 steps on the stairs that lead up to the first floor bedroom. The stairs are partly curved and enter the bedroom directly –there is no door here. The flooring up the stairs and in the bedroom is carpet. There is a king size bed and the height from the floor to the top of the mattress is 690mm (27inch). Height of clear space under the bed is 330mm (13inch). There is plenty of space to either side of the bed. The free space at the end of the bed is 610mm (24inch). The room is lit by two pendant ceiling light and two bedside table lights. The door into the en-suite is original pine colour, the walls are magnolia and the carpet is beige in colour. There is a low chest of drawers beside the wardrobe. There are two bedside tables with single drawers in. The shower tray has a raised lip of height is 250mm (10inch). The toilet seat height is 410mm (16inch) and there is minimal space to the right of the toilet. The height of the washbasin is 810mm (32inch). It is wall mounted and there is some clear space underneath. There is a single mixer tap with lever handles. The bath side height is 600mm (23.5inch). There is down lighting in the en-suite and some wall lighting. The walls and floor are a neutral colour. The flooring is non-slip vinyl. There is a small patio area to the front of the cottage. The width of the entrance into this between the cottage and the wall is 710mm (28inch). The ground is paved and it is lit by low level lights within the wall to the front of it. Details of local hospital and doctors and other emergency services are located in the guest information folder in the cottage. Both cottages have heat and smoke alarms fitted. There is generally a good mobile reception. A guest information folder and a variety of tourist information brochures are provided in each cottage. For Sat Navigation users the post code is CA12 5SA. Please be aware that once in Thornthwaite this may try to direct you to a very narrow road above the cottages however you should ignore this. 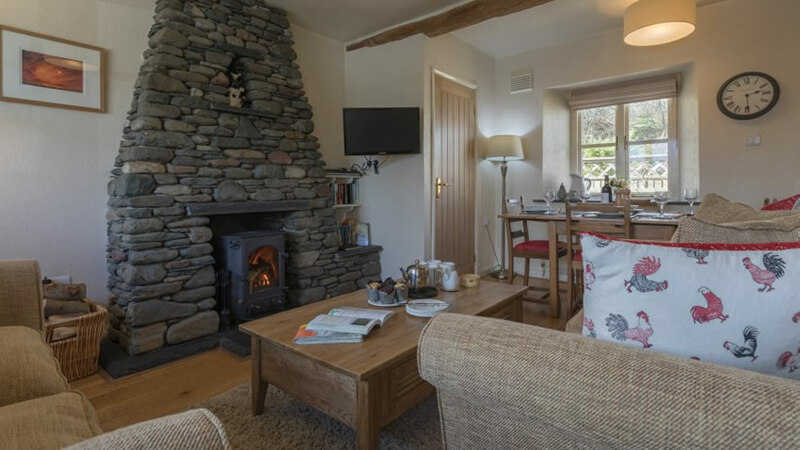 The cottages are located directly off the road that runs through Thornthwaite. To install support rails in the bathrooms.